This evening's edition of "Piers Morgan Live" will offer a decidedly masculine feel, as the British television presenter will welcome a quartet of established men, all tasked with offering their professional and personal perspective on a bevy of polarizing topics. As it's less than one week since Typhoon Haiyan wrought devastation and suffering on the Philippines, tonight at 9, CNN's Anderson Cooper will be on the ground in Southeast Asia, offering the latest updates as part of a special live report. And on the heels of his recent exclusive interview with Richie Incognito, and with the NFL's perceived bullying epidemic continuing to polarize the nation, FOX Sports' Jay Glazer joins the program with his insights from an exchange which dominated the weekend's news cycle. Meanwhile, with a brand new book – entitled "Crash and Burn" – and a history of wild television moments, guest Artie Lange is certain to bring his trademark brand of entertainment and enthusiasm when he sits directly across from Piers Morgan in the host's New York City studio. And, in advance of his latest documentary which recognizes the 150th anniversary of the Gettysburg Address, legendary filmmaker Ken Burns takes viewers behind the scenes of a project which features cameos from everyone from Bill Clinton and Steven Spielberg to Usher and Taylor Swift. Tune in to CNN this evening at 9 pm as Morgan and his magnetic men share an hour of television dedicated to touching upon a wide-ranging selection of fascinating topics. It was extremely disquieting to watch the coverage of the Phillippines disaster followed by an interview with Artie Lange. The contrast between the human distress and the personal travails of that low-class comedian slob tends to confirm that our values have become incredibly shallow. Ordinarily this is a good program. Try to avoid that sort of horrible juxtaposition in the future. I'm curious why you didn't change the channel? Artie Lange is a two time NY Times bestseller and gave an incredibly honest account of dealing with his addiction. By calling him a "low class slob" you show your true colors. You claim to show compassion for the victims of the Philippines, but not a person who has been through a personal hell and lived to tell his story. Mr. Cooper, Sadly the world's donations will not go to the poor victims. Philippines is managed by corruptors. PLEASE WE BEG YOU to account all donations. What is given to the poor is rotten rice, the good ones will be for business. all funds will go into their pocket. Will you send a World Organizer to help in distributing the donations? The politicians the more they will become richer because of the donations. the administration of president aquino is very weak and non-sense. Anderson Cooper has been doing great reporting about the disaster in the Philippines. Anderson, if yo are reading this, don't listen to that idiot Minister of the Interior who is accusing you of sending that tweet. The Philippine government (and yes I am a Filipino who has been living in NY for a long time), is the one of the most corrupt governments in the whole world. This corruption is ingrained in the culture and has been going on for the past 50 years. These government officials have no clue how to help the Filipino people b/c they have never done so. The only thing they are good at is stealing from the people, lining their pockets with money, bribery, and hiring people to kill other people. I am saddened about the plight of my country. Filipino people deserve better. These gov't officials are mostly criminals and need to be exposed to the whole world. Kudos to CNN. OH PLEASE! That is Tacloban. And the Capital of the Philippines is Manila. Tacloban is a city correct but in the province. You don't expect the President to be sitting there waiting for you to interview him. That is the same as you don't expect Obama in the Hurricane Sandy affected area 24/7 waiting to be interviewed and photographed. Philippines is composed of 7,107 islands and Tacloban is not the only place in the Philippines. Philippines as small as it is is divided into different provinces. NOW, the local government of Tacloban are victims themselves. Didn't you know 95% of Tacloban City is affected? Lucky are the 5% who are not affected or lease affected. Do you expect all the local government in Tacloban to be living in that 5 % area? NO! Correct? That is why help from the nearby provinces have to come in and help. Now, Anderson Cooper, if you job there in the Philippines is to just interview and take pictures and judge then, you can take your shots and be famous then get out of there before the people of Tacloban eat you! 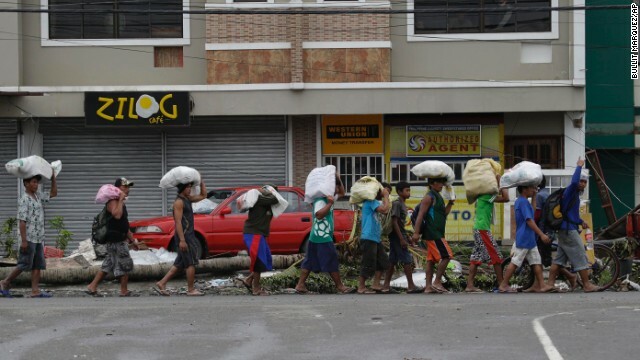 What Tacloban needs right now are people whose main purpose there is to help and help and help unconditionally. NOT JUDGE! Who are you to JUDGE? You were not there when all these things happened. You were not affected in anyway. You are there to earn a living by broadcasting what you want to see. But not to help. Get out of there. Michelle, you are obviously in denial. I feel embarrassed when I hear fellow Filipinos talk the way you do. Either you're a rich cronie (in which case you have an excuse, a bad excuse I may add) or you are just a moron (which is worse, then I feel sorry for you). Go back to school. Read. Open your eyes. Travel so that you can have a better perspective of things. Be truthful. Be compassionate about other people. Michelle, focus on the issue here: people are suffering and they need help! Tacloban may not be the only place in the Philippines but it needs the most help at this very moment. Anderson Cooper is not judging anyone, he's reporting things the way it is and a lot of credible sources are confirming this. So set aside whatever issue you have and go out do you part. In case you wonder, yes, I did my part and will keep helping however way I can. Good day. If the Philippines government could not protect their people from the warnings of Super Typhoon Yolanda, then how can the Philippines government protect their people from the future nuclear war that will happen in the year of our Lord 2020?